Witty Pi 2 is the new generation of Witty Pi, which adds RTC and power management to your Raspberry Pi, and can define complex ON/OFF sequence with simple script. Witty Pi 2 supports all Raspberry Pi models with 40-pin header, including A+, B+, 2B, Zero, Zero W, 3B, 3B+ and 3A+. Single tap on the button to gracefully turn on/off Raspberry Pi. After shutdown, the power for Raspberry Pi and all its USB peripherals are fully cut. Raspberry Pi knows the correct time, even without accessing the Internet. You can schedule the startup/shutdown of your Raspberry Pi. You can even write a script to define complex ON/OFF sequence. Comparing to the old Witty Pi, Witty Pi 2 uses much better RTC chip (DS3231SN), which only has <160 seconds error per year. Also this RTC chip has temperature sensor built-in, so you can read the temperature around your Raspberry Pi via the software. The new “dummy load” feature is very useful when you use power bank as power supply, it will draw peak current with certain interval, and keep your power bank alive. 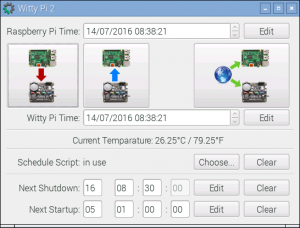 The Software for Witty Pi 2 is written with Bash (Unix shell), and there is also a GUI application available (requires QT 5). 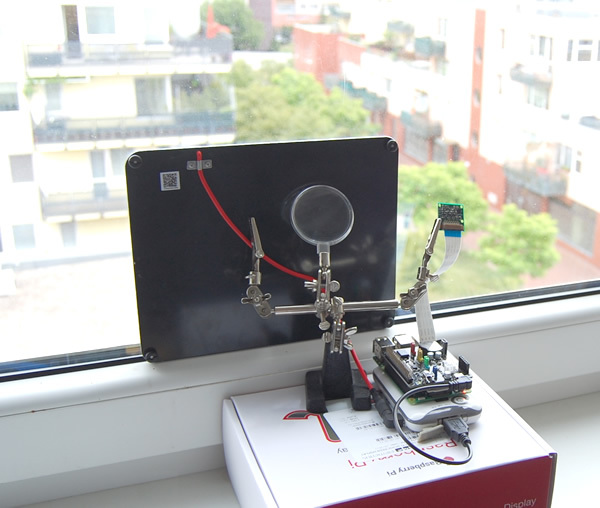 After the installation is done, reboot your Raspberry Pi and you are set. More details about software installation and usage could be found on the user manual. You can now use our web app to create and debug the schedule script for Witty Pi.